Blog | Better Healthcare for Africa | Alleviating suffering due to disease by supporting prevention and education efforts, improving maternal health and helping hospitals in Zimbabwe meet urgent needs. Purchase needed supplies, including suture material, injectable drugs, sterile and latex gloves, and pain relievers for women recovering from cesarean section. 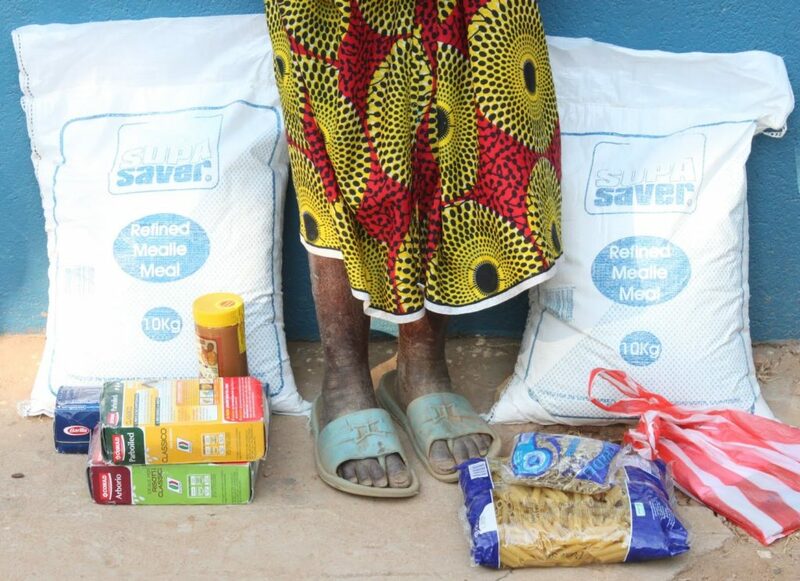 Purchase items for food packets the hospital gives to the malnourished and critically needy. This is especially important now through April, when the harvest begins. Maintain the cervical cancer prevention clinic. Dr. Julia Musariri describes conditions at the hospital here. I received the email below two days ago (Wednesday) from St. Albert’s Director Julia about the lack of working anesthesia machines at St Albert’s and other hospitals. We can only imagine the suffering of women around Zimbabwe who need caesareans or of adults or children with appendicitis, trauma, diabetic complications or other conditions needing surgery. In a chat, I asked Julia whether the machine could be repaired. She said spare parts are unavailable in the country — hard currency is not available to import them — and parts for older machines are often not stocked as newer model machines are added. Given the poor condition of the nation, it’s hard for someone to call around for availability and prices of parts or to shop around on the internet. Hospital staff were shocked to learn that new machines run $40,000-$80,000 — plus shipping and handling, no doubt! BHA is taking steps to learn how we might help with either the repair or replacement of this machine. Please let us know if you have ideas. And please send a donation to help St. Albert’s meet this and other needs during this dire period. I hope to find you well. We are all fine here. The situation is not pleasing. Our anaesthetic machine is malfunctioning, and the anaesthetists are no-more comfortable to work with it. We have told pregnant women to go to other hospitals to seek services. We first phoned Mt Darwin who told us that they do not have a functional machine, Bindura Provincial Hospital had no functional machine, Mvurwi had no anaesthetist and doctor, and the machine were not functional. The other two options were Howard and Karanda Mission Hospitals. So there was movement by the women who went to the Mission Hospitals. We called an engineer who is the ZCBC employee at the National Health Desk who should do periodic checks of all the Catholic Hospitals machines. He says we should think about a new machine, a standard one. BHA is a sectarian and nonpolitical organization. At the same time, we want you to know about the current economic, social and political events that affect St. Albert’s Mission Hospital. BHA’s mission is to help St. Albert’s in particular provide care to the sick and injured. We offer this post to help you understand the hospital’s circumstances and needs as we appeal for your support. Attached for download is the letter “Rebuild Hope, Trust, Confidence and Stability in Zimbabwe” from the Zimbabwe Catholic Bishops’ Conference dated 17 January 2019 giving its perspective about events in the country. The food hampers that St. Albert’s provides to the hungry and malnourished include two sacks of mealie meal (corn meal), cooking oil, pasta, beans and dried fish. The contents of a food hamper that St. Albert’s Mission Hospital has provided an 80-year old woman. Her feet and legs show signs of pellagra, a form of malnourishment. Donate here to BHA and help St. Albert’s ease hunger and suffering among the needy coming to the hospital. There have been many news reports recently about deteriorating conditions in Zimbabwe. Here is how how those conditions are affecting St. Albert’s Mission Hospital. 17 January: St Albert’s township was quite during the stay-away. All shops were close for three days for fear of arson. Public transport was unavailable. Afterward, the hospital was not busy because people could not afford the increased fares. The hospital’s greatest needs include analgesics for post-surgery women, suture material, injectable medicines, and sterile and latex gloves. The hospital also needs funds to pay for the servicing of hospital vehicles that are also used as ambulances. “We have failed to raise the $2 500 and $3 600 needed to bring the vehicles back from the garages,” says Dr. Julia Musariri. Click here to download a PDF of Christmas 2008 – St. Albert’s Mission Hospital, an accordion-fold book that I made to honor Dr. Elizabeth Tarira. Elizabeth was director of St. Albert’s from 1999 to 2012. I met her in 2000 when I first visited St. Albert’s during a Fulbright-grant funded project, and I came to know her well. She died of recurrent breast cancer in July 2012. The book presents an eight-paragraph email that Elizabeth sent to hospital supporters shortly before Christmas 2008. In it, she described conditions at the hospital and suggested how donors might help her and the hospital cope with those conditions. She closes her email in way that expresses her positive, buoyant spirit. The paragraphs are presented one at a time followed by a photo of mine, most taken during a visit in 2009. Today, 10 years later, Dr. Julia Musariri and the staff at St Albert’s are coping with very similar conditions. Dr. Musariri describes them in this three-minute video recorded during our visit in September 2018. BHA needs your support if we are to continue helping Dr. Musarir and reducing suffering from cancer at St. Albert’s and Karanda hospitals. Please send a donation when you can. Hi, Everyone – On 13 April, 2018, BHA received the email below from Dr. Musariri thanking BHA and its friends for the $5,000 sent to help the hospital meet a critical shortage of basic drugs and supplies. And we want to again thank the BHA supporters who contributed! Accept our sincere gratitude for the medicines you bought for us in our time of extreme need. The staff was happy they had something to use. We live on hand to mouth system in our health institutions but because we have you out there we are happy of the support. Darrell I do hope that your are now home and feeling much better. I have attached a report and the invoice. Greetings from St Albert’s Mission Hospital we are all very grateful for the funds you availed us to buy medicines and medical sundries which were out of stock. We had a relief of the urgently needed medicines when you came to our help. Having purchased the medicines for the $5055USD you availed us the gap was briefly closed. We were able to resuscitate patients and to treat them. The political and economic environment is extremely unfavorable for health institutions. Thank you for the care, concern and understanding. We always are fed on promises which never in many instances bear any results. On behalf of St Albert’s Mission Hospital team we wish you the best of God’s care and blessings. 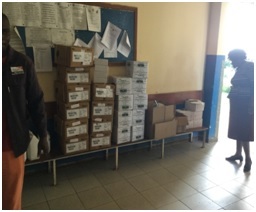 Hello, Everyone – On 22 March 2018, BHA received an email from Dr. Musariri, the director of St. Albert’s Mission Hospital, asking for help in the purchase of critically needed drugs and supplies. We sent an email to BHA supporters seeking donations and received about $2,700. We sincerely thank all those who contributed. BHA then sent a little over $5,000 to St. Albert’s, which helped Dr. Musariri though the crisis, though the need was much greater. Below is the appeal we sent to supporters, which included Dr. Musariri’s original email. Please note that BHA will gratefully accept donations to help the hospital meet future critical needs and to continue the hospital’s cancer prevention programs. Please note also that BHA is an all-volunteer organization with very little overhead, so nearly all your donation goes to help the hospital. The trimmed list is attached and totals $5,000. It describes simple, highly effective medications and intravenous fluids essential for basic patient care. Zimbabwe and its healthcare system are in severe economic distress. Medical supplies are scarce. Doctors at national hospitals have been on strike for more than three weeks, causing people to travel to St. Albert’s and other mission hospitals for treatment. Your donations to BHA help St. Albert’s Mission Hospital to remain open and to provide medical care to the 120,000 people in its impoverished rural district and others who come from as far away as Harare and Mozambique. During 2017, we focused largely on maintaining the hospital’s cervical-cancer prevention program and improving water availability within the hospital. Please note that we need your help to continue our work in 2018. Please make a donation here. The program began in August 2013 and has continued uninterrupted since then, thanks to grants administered by BHA and obtained by oncologist Dr. Lowell Schnipper, Theodore W. and Evelyn G. Berenson Distinguished Professor of Medicine in the Field of Oncology, Harvard Medical School, Clinical Director, Cancer Center and chief of Hematology/Oncology Division, emeritus at Beth Israel Deaconess Medical Center Cancer Center. As of March 31, 2017: St. Albert’s had screened a total of 7,305 women; identified 329 women with precancerous changes and more than 74 women with likely cervical cancer; conducted 16 awareness campaigns; eight screening outreaches screened 154 women at rural health centers who could not afford to travel to the hospital. A grant awarded to Dr. Schnipper provides $20,000 per year for 2017-19. That amount primarily covers the wages for four nurses who conduct the clinic and outreach screenings and fuel for outreach screenings. Donations from you are needed for additional expenses, such as replacing a broken camera used to photograph the cervix to help with diagnosis and quality control. 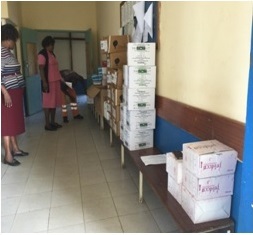 A second and similar three-year grant obtained by Dr. Schnipper supports cervical-cancer screening at Karanda Mission Hospital over the same period. Our July trip to Zimbabwe (described below) included visiting Karanda to discuss the needs of their VIAC clinic with Dr. Paul Thistle, OB/GYN, and provide a cancer-education workshop to hospital staff. 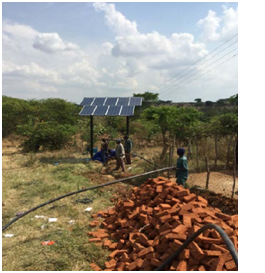 Installation of the solar-powered water pump at St. Albert’s Mission Hospital. Dr. Julia Musariri, director of St. Albert’s, began dreaming of a solar-powered water pump in early 2017. It came when the hospital had no general electricity for 14 days and “water from boreholes became zero.” They used a tractor pulling a water tank to bring water to the kitchen, laundry and to some homes. “We had to discharge most of our patients except for those who were critical. It was difficult to manage the hospital with piles of [soiled] linen because [the laundry] could not cope by hand washing,” wrote hospital director Dr. Musariri. A solar-powered water pump would enable the hospital to continue operating even during prolonged power losses. The pump was purchased with the help of a $2,000 donation to BHA raised by the St. Louis College of Pharmacy’s International Student Organization during their 2017 annual fundraiser in May. In the end, however, the cost of the pump was more than $9,400. Additional funds were provided by donations from Dr. Lowell and Hester Schnipper and by your donations to BHA. February: A long-awaited shipment of refurbished medical equipment arrived at St. Albert’s that was paid for by a grant obtained by Dr. Lowell Schnipper. The equipment was provided by the International Medical Equipment Collaborative (IMEC). It included a badly needed X-ray unit, a suite of rehabilitation equipment, a chemistry analyzer, GeneXpert, exhaust hood and other equipment for the hospital’s clinical laboratory, among other things. BHA helped coordinate the shipment and served as the shipper of record. BHA also funded an expansion of St. Albert’s clinical laboratory that was necessary to accommodate the new fume hood and equipment. May: BHA helped coordinate visits to St Albert’s by two pediatric fellows from Nationwide Children’s Hospital in Columbus, Ohio. One of the young doctors was trained in the fundamentals of neonatal resuscitation through a program called Helping Babies Breathe. She brought several mannequins with her to train midwives and other providers at St. Albert’s in the technique. She also carried a new battery for a MacBook Pro, used by one of the St. Albert’s doctors, and an HDMI cable to connect the laptop to the hospital’s projector, both purchased by BHA. A second fellow from Nationwide Children’s was already at St Albert’s. Five pediatric fellows from Nationwide Children’s have visited St Albert’s in the last three years, and BHA helped coordinate all of them. Also in May: Dr. Anna Nyakabau, a radiation and medical oncologist from Zimbabwe, traveled to Boston for about 10 days to visit Dr. Schnipper and observe radiation and medical oncologists at Beth Israel Deaconess Medical Center. She then came to Columbus to observe the treatment of breast and other cancers at Ohio State University’s Comprehensive Cancer Center – James Cancer Hospital and Solove Research Institute. I then drove Dr. Nyakabau to Chicago where she attended the American Society for Clinical Oncology (ASCO) annual conference before returning to Zimbabwe. Along with an interest in the treatment of breast, cervical and prostate cancer, and radiation technique called brachytherapy, Dr. Nyakabau works to improve cancer control activities in Zimbabwe. While at Ohio State, she recorded a video titled “Cancer Prevention in Zimbabwe and Other Under-Resourced Countries,” which is now part of the online course offered free by the Ohio State cancer program called Introduction to the Science of Cancer. June: An editor at the Financial Gazette newspaper in Harare contacted BHA. The result was an article I wrote (consulting with physician friends in Zimbabwe.) about the importance of cancer education and cancer literacy for The Health Funder, a magazine published for the Association of Health Funders of Zimbabwe. You can see the article here and the issue here: The Health Funder magazine. A meeting at Island Hospice to explore the possibility of palliative care training for St Albert’s and Karanda and to accompany a hospice nurse for an afternoon of home visits in a high-density area of Harare. A guest lecture presented by Dr. Schnipper at Parirenyatwa Hospital about how research leads to new cancer therapies. Were updated on improvements to the hospital’s water system that BHA and Dr. Schnipper have supported. Were updated on the area’s food situation. Delivered a ballast unit for the fume hood in the hospital’s clinical laboratory and a number of packH2O water backpacks donated by a Columbus, Ohio, businessman. We held two half-day cancer workshops for nurses and staff. The workshops used six videos from Ohio State’s free online cancer course Introduction to the Science of Cancer and were moderated by a physician assistant at Karanda. August: Dr. Schnipper helped doctors at Parirenyatwa Hospital obtain a donated subscription to UpToDate, an online source of medical information for all manner of medical and surgical problems. It is used widely by physicians at many U.S. teaching hospitals. During much of 2017, Dr. Schnipper worked with Dr. Paul Thistle at Karanda, Dr. Megan Fitzpatrick at Stanford and others to organize a study to learn what subtypes of HPV were prevalent among women coming to Karanda for cervical screening. The study should begin soon and could produce data that will help estimate the effectiveness of current HPV vaccines in Zimbabwe. Thanks to your donations, the hospital had water during critical times in spite of electrical outages. That is just one of the ways that you make a difference. Your support helps the doctors and staff at St. Albert’s continue their work. Please make a donation to BHA today. Thank you for your consideration and for your support! Dr. Lowell Schnipper and I visited St. Albert’s in late July and early August 2016, mainly to learn more about the needs of the hospital’s cervical-cancer prevention program. Dr. Schnipper is an oncologist with Beth Israel Deaconess Medical Center and Harvard Medical School. Joining us was Ms. Megan Jukich, who manages a clinical laboratory at The Ohio State University Comprehensive Cancer Center – James Cancer Hospital and Solove Research Institute, where I also work. Megan provided the following account of her visit to the hospital. We arrived at St. Albert’s at 1 a.m. on a Friday morning after nearly two days of travel (and a few hiccups) from Columbus, Ohio. I walked into the guest cottage and happily collapsed into bed, relieved that I could fully recline and sleep. Despite my exhaustion, I awoke early and, after enjoying a lovely breakfast with my companions, Darrell Ward and Dr. Lowell Schnipper, we headed up the path that led to the hospital. 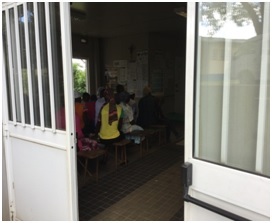 We crossed through the gate onto the hospital grounds where we met Dr. Julia Musariri for a tour of the hospital. Back in Ohio, I work at a state-of-the-art cancer hospital. We treat patients every day with life-saving drugs, and, when those fail, we treat them with experimental drugs in an effort to both prolong their life and learn how to treat future patients. I oversee a laboratory that has protocols and processes that we follow to ensure that we comply with or exceed standards. We follow safety precautions when handling patient specimens, just as anyone caring for these patients would in any other part of the hospital. But this was my first visit to a hospital in a developing country, and during my time at St. Albert’s, I saw things that I struggled to comprehend. Long before we arrived, the region had been suffering through a severe drought. The hospital water system provides water to the entire mission of 3,000 people. It includes the 140-bed hospital, the parish, the primary and secondary schools, school staff and the relatives that live with them. The secondary school has 900 students. The primary school has a total 1,200 students. The rest are mission staff with their domestic workers and other dependent relatives. By the time we arrived, the hospital was rationing water to the entire community. Prolonged drought led to water rationing at St Albert’s in 2016. 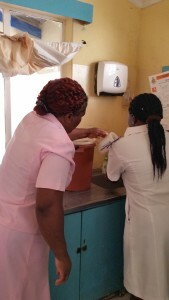 It meant that one nurse had to pour water from a pitcher over the hands of another nurse for hand washing. It’s hard to imagine how a hospital can function without running water, yet St. Albert’s was forced to. There was no alternative. This meant that we had to flush toilets in the hospital using buckets of water and that a surgeon scrubbing for surgery used water poured over his hands by a nurse from a bucket of water. There was rarely soap and certainly no hot water. Without these basic things, the chance for disease and infection to spread is so much higher and it’s nearly impossible to thoroughly clean things like surgical instruments, work surfaces, and floors of operating theaters. Having to carry in water requires extra labor for an already overworked staff. And what would happen if the buckets of water ran low at a critical moment? Walking through the male and female wards, I noticed that patient beds were different sizes and and models, a result of what was available or donated. Some beds had mosquito netting above them, but some did not. Signs posted around the hospital encouraged the opening of doors and windows to help stop the spread of tuberculosis. The reason for many hospitalizations, according to Dr. Julia, was diarrhea, respiratory infections and pneumonia. Since most households have limited access to clean water and the inability to practice hand hygiene because they cannot afford soap, it’s easy to understand how sickness can spread quickly. In addition, most dwellings house a large number of people in a small space, so it’s no wonder that infections spread easily from person to person. nutritionally-balanced meal, yet it’s what the hospital can provide. There is also a post-natal wing, and across from that is a small room for premature babies. They are looked after by the nurses at St. Albert’s with no help from life-sustaining machines such as ventilators or incubators. I learned of a baby born with twisted arms and legs that survived only a few hours. The only help that could be offered was to cast his limbs in plaster in the hopes of straightening them. In the male ward was a man whose foot had been run over by an ox cart, a fairly common injury in rural Zimbabwe. Another patient, an epileptic, had a seizure and fell into a fire. His foot was burned so badly that his toes had to be amputated. These are the real risks of everyday life in rural Zimbabwe. If someone is lucky enough to have a mode of transport aside from walking or a bus, it’s often an ox cart. Being bounced around or leaning too far over the side can easily lead to falling out and being run over. Burns are common because a large fire for cooking is found inside (or outside) nearly every home, often the only way to boil water or prepare sadza. Our visit to the hospital pharmacy revealed mostly empty shelves. Zimbabwe’s National Pharmacy has no medications to supply to the nation’s hospitals. In the rehabilitation department, the staff helps patients as best as they can using hand-me-down crutches, walkers and exercise equipment; a pile of recycled casts and mismatched braces for arms and legs is piled in a corner. In the hospital kitchen, food is prepared for patients and staff using biofuel from an underground biogas generator buried nearby. The laundry includes a sewing room where we meet the woman who makes surgical pads used during operations by hand because buying them pre-made is too costly. The counseling offices are located near the administration block. HIV testing is offered there, along with suicide, domestic violence and grief counseling. It was here, with the social workers and counselors, I would spend most of my time in the coming week. I had the privilege of observing several counseling sessions throughout the week, always with the permission of the person seeking help. The sessions were in Shona, but the counselors translated for me so I could understand the problem. Each session left me feeling numb and drained. I knew that Zimbabwe was not immune from issues such as suicide and domestic violence, but as I began my visit, I suppose I anticipated other, perhaps more stereotypical problems, such as AIDS and HIV infection. As I observed the counseling sessions, I was struck by the dire circumstances facing each individual. In one case, a 21-year old woman spoke of her husband abusing her. It was the ninth time it had happened in their three year marriage. She sat slumped in the chair, hat pulled down to cover her eyes. Everything about her signaled defeat and despair. She came for HIV testing because although she was faithful, she wasn’t sure that her husband was. Her test results came back negative, and although she said she wanted to use protection with her husband in the future, the reality was that he likely would not agree to it, leaving her continually at risk if he is unfaithful. In another case, I sat silently as a man talked of ingesting pesticide, an increasingly common way to attempt suicide. Although I couldn’t understand what he was saying, his voice shook as he spoke and he often seemed on the verge of tears. I’ve been in that same vulnerable state, and it was all I could do to keep from reaching out and taking his hand, a tiny gesture from one human to another who has been where he was. I was also fortunate enough to venture out for a day with the Community Home-Based Care team. It was a continuation of a launch of a sanitation and hygiene initiative sponsored by CAFOD, a Catholic international development charity based in England and Wales. 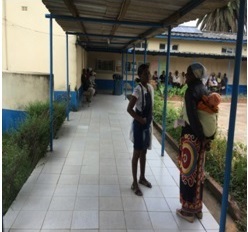 We visited a local primary school, rural health clinic, secondary school and village – all were participants in the pilot project because of their vulnerability to disease outbreaks. Centenary itself had experienced an outbreak of typhoid just two weeks earlier. I was shocked to see that there was only one toilet for boys and one for girls at the primary school, which served over 500 students. Upon arriving at the secondary school, a group of students told us that the toilets had no water, leaving no way to flush the waste or for students to wash their hands. In all of the toilets, waste was overflowing and we were told it was cleared away only twice per week. The smell inside the boys’ toilet was overpowering. I couldn’t comprehend how these students, many of whom overcome many challenges to even attend school in the first place, dealt with the obstacle of not having access to a working toilet every day, all day. I was facing my own challenge that day – the start of my menstrual cycle. After going all day without access to a toilet, I was grateful when we stopped at a shop. I was close to tears when I discovered the bathroom consisted of a toilet bowl with no seat, toilet tissue or running water and more than a few flies. Later that night, I realized that what I had to deal with that day was ugly and uncomfortable, but this is what the community around St. Albert’s faces every day. An overwhelming majority of women and girls cannot afford a luxury such as tampons or sanitary pads. The reality is that school attendance by girls drops around the time that they begin menstruating. Not only is it a challenge, but it has a significant negative impact on their education. In the weeks leading up to my arrival at St. Albert’s, I thought about what I might experience while there, but I had no expectations. Every day, I marveled that this hospital continued to function – not only function, but thrive – under the most challenging of circumstances. Moreover, the staff continue to keep their heads up, continue to smile, continue to persevere. It would be so easy for compassion fatigue to set in, seeing these things day in and day out, and perhaps it does, but I never witnessed it. In the short time I was there, the times I had to catch my breath or fight back tears became too numerous to count. In the evenings, I found peace in taking walks through the nearby hills, watching a glorious sunset, or sitting under the stars marveling at their brightness and the clarity of the Milky Way, neither of which pictures can do justice. Yet, I woke up every morning grateful for a chance to do it all over again. I laced up my sneakers and walked the dirt path up to the hospital. Day in and day out, my heart felt fuller as the layers of dirt continued to coat my shoes. I never expected to love this community as much as I do, especially within such a short time . I never expected to be so sad when I left, worried about how they would continue to get what they need to do their work. I certainly never expected to return home filled with the notion that I could make a difference, but that is what I intend to do. To this day, I put on those sneakers, now a deep brown instead of their usual grey, and think about the path that I walked and where it’s leading me. I can’t bring myself to wash away the dirt – it’s a daily reminder of those I left behind, and I’m looking forward to the day l I can return to them.